Developers of adware programs often target users who like to shop online. Harvest Savings is also promoted as an application that will help you save time and money while you search for goods on the Web. It promises to show you coupons containing the best promotional codes at thousands of online retail websites. This may look beneficial, but we strongly suggest that you remove this program from your device. Harvest Savings will annoy you with countless ads and just a single click on any ad may result in harsh consequences to your virtual security. Besides, this program is distributed in a deceptive way. Probably you have no clue how the program has sneaked into your computer, but we will explain that to you. The program is unavailable to download from its official website. That is intentional as developers of adware applications commonly use the software bundling method for distribution of their products. The method works the following way: applications come in a package together with some program that user downloads from file sharing websites and installs on his computer. Usually, people run through the installation wizard without paying any attention to it and allow additional programs to enter their system. So, if you found Harvest Savings on your computer, it means that you should increase the level of your online security. During our research, we have found that Harvest Savings is identical to ProShopper and Sliding Coupons. Both of these programs are not very dangerous threats themselves, but keeping them installed may lead to unwanted and unpleasant consequences. The same applies to Harvest Savings. The application installs an extension to your browser and shows commercial ads through it. You will encounter pop-ups, banners, and interstitial ads when you surf the Web. Not every ad is dangerous, but some of them may contain redirect links to suspicious websites that are created for criminal purposes. For example, they may look identical to the webpage of your online bank, and you could be fooled to enter your personal credentials. Do you think that the creators of Harvest Savings will compensate any possible losses if a financial attack on you is successful? Just open the End User License Agreement and look at some very informal comments for the text. For example: “As we said, since we give you the Plugin for free, we're not liable for anything.” Or “If someone else’s website or browser extension does something bad to you, we’re not responsible for that.” Creators of Harvest Savings not only accept no liability if something bad happens; it looks like they try to make fun out of you. 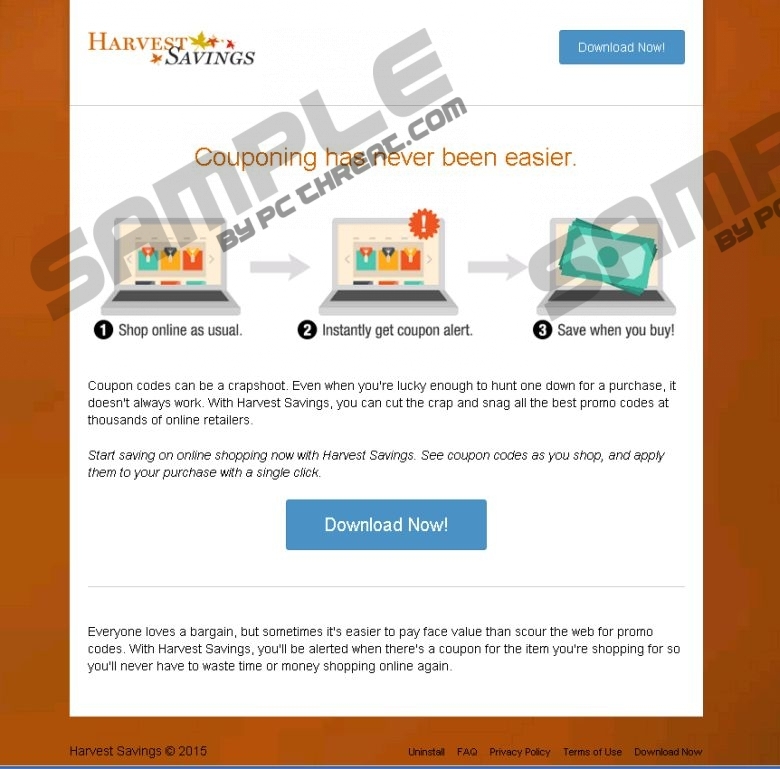 The best way to deal with Harvest Savings is to remove it with reliable antimalware software. Keep the program regularly updated and your system will be safe and protected. Of course, you can fight against unwanted programs yourself. In that case, we have prepared a guide explaining how you can get rid of Harvest Savings manually. If you encounter any obstacle while eliminating this program, feel free to contact us via the comment box below. We will come up with an answer as soon as possible. Go to Control Panel and access Add or Remove Programs. Open Uninstall a program and remove Harvest Savings. Press Alt+F, click on More tools, and select Extensions. Click the recycle bin icon near the unwanted extension. Open Extensions and remove the unwanted one. Open Toolbars and Extensions and remove the undesirable extension. Quick & tested solution for Harvest Savings removal.